Not much info is out there about Tommy Feline. According to RedHotJazz he played banjo with Jay C. Flippen, but doesn’t credit which songs he appears on. But only lists the banjo for one song, and its painfully hard to figure out which song it is (click the link and you will see why). Personell: Frank Cush, Ed Farley – Trumpets; Al Philburn – Trombone; Lou Bode – Clarinet/Alto Sax; Mace Irish – Clarinet/Alto Sax; Paul Mason – Clarinet/Tenor Sax; Adrian Rollini – Bass Sax; Max Ceppos – Violin; Chauncey Gray – Piano; Tommy Feline – Banjo/Guitar; Ward Lay – String Bass; Stan King – Drums. Note: Smith Ballew is the Vocalist on “Blue Is The Night” Some of his recordings with Lown were issued using the pseudonym Buddy Blue. He also is credited on the album “Dorsey Brothers Band/Red Nichols: New York Jazz: In The Roaring 20s” but again, I don’t know what song. He played with Annette Hanshaw, what songs? Who knows. I’d like to know. I’m guessing he was a studio musician. It would be nice to match the name with the songs he played on, and even better to get a picture to match as well. January 13, 1909 – March 13, 1994Daniel “Danny” Moses Barker was born on January 13, 1909, in New Orleans, LA. Born into a musical family, his interest in jazz came early. His grandfather, Isidore Barbarin, had been a member of the great Onward Brass Band. Clarinetist Barney Bigard, who played with Duke Ellington, gave Danny lessons in clarinet. His uncle, the great jazz drummer Paul Barbarin, also taught him how to play the drums. Nonetheless, when it came to playing music, Danny settled on the banjo and guitar as his favorite instruments. In 1930, he married Louise Dupont, who sang blues and was better known as “Blue Lu” Barker. The couple moved to New York that year where he led the life of a jazz musician; working the clubs and doing session work. While there, he worked with great musicians like Red Allen, Sidney Bechet and the legendary “Jelly Roll” Morton . In 1938, he recorded with Decca Records. Along with his wife Blue Lu, he wrote her best known hit, “Don’t You Feel My Leg” a risqué tune recorded as “Don’t You Make Me High”. Also in that year, he joined Benny Carter’s Big Band. The following year, he became rhythm guitarist for Cab Calloway’s Big Band and played and recorded with Calloway until the late 1940s. Following his break with Calloway, he became a freelance rhythm man recording in New York with other great New Orleans transplants such as Sidney Bechet. By the mid 1960’s, he and his wife decided to return to New Orleans and keep the traditions associated with jazz music alive by lecturing on traditional jazz history. He founded the Fairview Baptist Church Band to continue the marching band tradition. 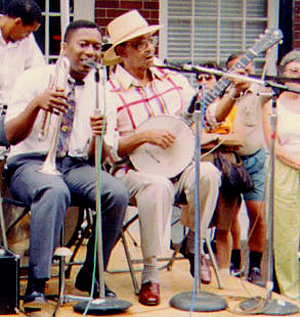 Young musicians like trumpeter and composer Wynton Marsalis and drummer Herlin Riley were members of the Fairview band. Barker continued performing and sharing his love and knowledge of jazz music until his death on March 13, 1994. 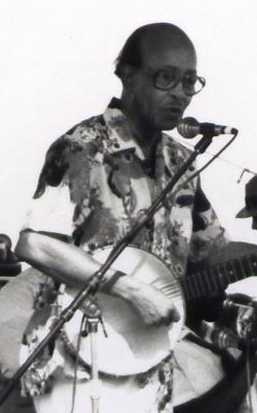 Guitarist and banjoist Danny Barker, a nephew of drummer Paul Barbarin, discovered his interest in music at an early age and was soon taking clarinet lessons from Barney Bigard. Because of his uncle, Danny was often found cutting school and following many bands around town witnessing some of the finest New Orleans had to offer including bands led by Buddy Bolden and Bunk Johnson, the Imperial, the Eagle Band and the Superior. This led to his first gig playing banjo subbing for an intoxicated Babe Son in Kid Rena’s band. After this surprising debut, Barker began taking banjo lessons from George Augustin of the Imperial band, and came under the direct influence of Lorenzo Stall, Buddy Bolden’s banjoist. It was not long before he dubbed “Banjo King of New Orleans”. In 1930 Barker moved north to New York City where he switched from banjo to guitar and in 1938 joined Benny Carter’s Big Band and from 1939 to 1949 was the rhythm guitarist for Cab Calloway. In 1947 he took a job as guitarist for the “Jazz on the River” weekend cruises up and down the Hudson river where he played with fellow New Orleanians Albert Nicholas, Pops Foster, Baby Dodds, pianist James P. Johnson and cornetist Wild Bill Davison. Barker then worked as a freelance rhythm man around New York playing and recording with Sidney Bechet and Mezz Mezzrow, Bunk Johnson, Edmond Hall and Henry “Red” Allen. By 1965, Barker, back in New Orleans, had married singer Blue Lu Barker. He split his time between performing with his wife and the Fairview Baptist Church Christian Band which he founded, lecturing on traditional jazz and working as Assistant to the Curator of the New Orleans Jazz museum up until his death in 1994. The Smithsonian Jazz website features recordings of Barker recounting stories. A jazz banjoist and guitarist with a career that stretched over parts of eight decades, Danny Barker lived the history of jazz in the twentieth century. Then, late in life, he became one of its most qualified chroniclers, drawing upon his recollections of the early days of jazz in New Orleans. Danny Barker spent his first six years living with his father’s family in a two-story apartment building on Chartre Street across from the French Quarter Ice. His grandfather on his mother’s side was Isidore Barbarin, a founding member of the original Onward Brass Band. And Danny’s uncle, Paul Barbarin, played in bands led by top jazz artists including King Oliver, Henry ‘Red’ Allen, and Sidney Bechet. Barker would follow in his Uncle Paul’s footsteps, leading to his first gig playing banjo subbing for an intoxicated Babe Son in Kid Rena’s band. After this surprising debut, Barker began taking banjo lessons from George Augustin of the Imperial band, and came under the direct influence of Lorenzo Stall, Buddy Bolden’s banjoist. It was not long before he dubbed “Banjo King of New Orleans”. In 1930 Barker married the singer Louise Dupont, and the pair followed the migration undertaken by other jazz musicians and moved to New York. They often performed together, as Blue Lu Barker with Danny Barker’s Fly Cats. Barker switched from banjo to the more modern guitar. Barker’s excellence as a musician came in the late 1930s, when he played with bands led by Lucky Millinder, Benny Carter, and, for an eight-year stint extending through World War II, Cab Calloway. Barker played sharp melodic solos on the guitar that diverged from the chordal playing that had previously been the norm. He appeared on over 1,000 recordings, and, by some estimates, played with a greater number of jazz bands and artists than any other musician. Barker left Calloway’s band in 1946. He played in the 1940s with bebop pioneers Dizzy Gillespie and Charlie Parker, and even essayed the new and guitar-heavy rhythm-and-blues style in the postwar years. In 1947 he took a job as guitarist for the “Jazz on the River” weekend cruises up and down the Hudson River where he played with fellow New Orleanians Albert Nicholas, Pops Foster, Baby Dodds, pianist James P. Johnson and cornetist Wild Bill Davison. Barker then worked as a freelance rhythm man around New York playing and recording with Sidney Bechet and Mezz Mezzrow, Bunk Johnson, Edmond Hall and Henry “Red” Allen. By the 1950s, however, audiences were beginning to manifest a new interest in the roots of jazz, so Barker took up yet another new instrument, the six-string banjo, and began to perform in so-called “Dixieland” New Orleans jazz revival bands. In 1965 Barker was appointed Assistant to the Curator of the New Orleans Jazz Museum, he lectured on jazz at several universities, helped launch the first New Orleans Jazz Festival, and formed the Fairview Baptist Church Brass Band. On the national stage, Barker worked to perpetuate jazz traditions, both as a musician–his final album, “Save the Bones,” was released in 1988, and as an author. 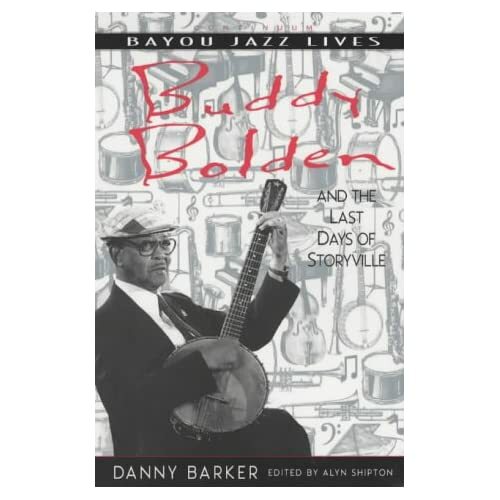 Barker co-authored a 1973 collection of jazz reminiscences entitled Bourbon Street Black, released his own autobiography, A Life in Jazz, in 1986, and then published a biography of cornetist Buddy Bolden, the legendary but unrecorded New Orleans musician who, in the opinion of many historians, did more than anyone else to create jazz as a distinct music. In that volume Barker drew on stories he had heard from his own family, tightly woven as it was, into the musical life of New Orleans. Barker was honored at the end of his life with a Lifetime Achievement Award from the National Endowment for the Humanities in 1991, and was inducted into the American Jazz Hall of Fame in 1993. He died of cancer on March 13, 1994, not long after appearing as the king in a New Orleans Mardi Gras parade. Danny Barker’s books are available on Amazon.com. From the New Orleans Public Library. Looks like "Manny" is playing a 6-string "banjitar" (or "Gitjo", take your pick). A longtime fixture in New Orleans, Emanuel Sayles was a valuable supportive player and an occasional soloist for decades. Although he studied violin and viola early on, Sayles was self-taught on banjo and guitar. After attending high school in Pensacola, Florida, he moved to New Orleans where he played with William Ridgley’s Tuxedo Orchestra. Sayles worked with Fate Marable, Armand Piron and Sidney Desvigne on riverboats and in 1929 recorded with the Jones-Collins Astoria Hot Eight. After moving to Chicago in 1933, Sayles led his own band and worked extensively as a sideman in both jazz and blues settings, recording with Roosevelt Sykes. He moved back to New Orleans in 1949, performing with most of the top local players including George Lewis (who he toured Japan with in 1963-64) and Sweet Emma Barrett. Sayles worked in Cleveland with Punch Miller in 1960 and spent a few years (1965-67) in Chicago working as a house musician at Jazz Ltd. After coming back to New Orleans in 1968, Sayles played with the Preservation Hall Jazz Band and became a world traveler. Emanuel Sayles, who recorded with Lewis, Barrett, Punch Miller, Peter Bocage, Kid Thomas Valentine, Earl Hines (1975) and Louis Cottrell among others, also led his own sessions for GHB (1962), Nobility (1963), Dixie (1969) and the Italian Big Lou label (1969). Red Hot Jazz has Real Audio of Jones & Collins Astoria Hot Eight. Unfortunately though, it seems like newer versions of Real Player won’t play the redhotjazz files, which has been killing me for a while now. Looks like there is some info out there on google about Manny. I can’t find any information other than these photos about H.E. Minor.